Today marked a milestone for Idle No More as thousands gathered for protests, sacred drumming and fires, and speeches sustained throughout the day, across Canada. Attawapiskat Chief Theresa Spence, one month into a hunger strike, made a brief press statement while other First Nations chiefs led rallies or represented in a high stakes meeting with Prime Minister Stephen Harper. In Vancouver, over 500 marched and rallied in solidarity on City Hall. As if on queue, at the mid point an eagle soared overhead, suddenly the PA system was patched, and the poignant statements of speakers resonated louder throughout the park at the seat of Vancouver government. 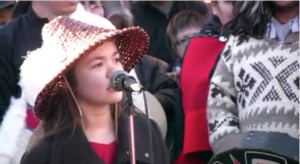 At 11 years old, Ta’Kaiya has already established herself as First Nations singer-songwiter and international activist. 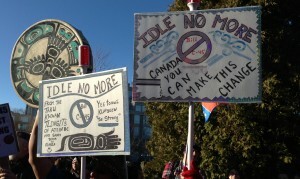 About a year ago, at an Occupy rally, she introduced Earth Revolution and without missing a step today from her position on Idle No More she performed a heartfelt rendition of this amazing song.